With the cinematic, transient, “Intro,” Summon the Octopi perfectly slide into “Slobodan The Sloth,” beginning Nonversations, an EP that sees little need for words, focusing more on the feeling of the music. “”Slobodan The Sloth” carries on with an entrancing instrumental, that gives the song a special kick that makes it so striking; it may be the slow beginnings and the edge that gives the sensation of striking slowly, yet suddenly. Bass-heavy, rhythmically driven, exploratory, in a beautifully creative sense, the song manages to shift between tones that fade into each other perfectly, acting like a spectrum throughout the track, adding depth and character. “It’s Been Sick, So I Tried To Feed It Some More” is possibly my favorite. A stand-out track, there is a distinctive quality to it, with a more evident shifting in tone, all at once while maintaining overall emotion. Instrumentally, it is the guitars, filled with a such a soulful sound, they almost seem to be singing, that pull the listeners in, creating a short, but gripping track. Just as distinctive, the one track with vocals on it, “Rehabosaurus Rex.” It is odd, but until the vocals come crashing in, it was almost as ifI hadn’t noticed the lack of singing. Paired with enchanting guitar and stunning imagery, quietly delivered, yet powerful, lyrics and raw emotion seep through, giving it an unusual clarity. “Apricots Apricate (Alligators Alligate)” may be a silly name for a song, but with a sound that is reminiscent of lazy summer days by the pool, floating on your back, staring up at the sky, half bored, half transfixed, Summon The Octopi prove that silly names are nothing more than the title (“a rose by any other name would smell as sweet”). Melodic and, above all, inspired, the song has originality in every note, which is much appreciated in a world where many artists sound exactly alike. 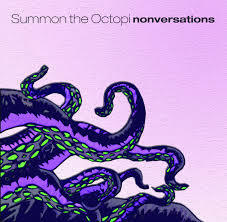 Thankfully, Summon The Octopi don’t sound like every other band; that being said, their songs don’t even carry an imitative bone. “Lulling Waves, Sullen Gaze (All Is Space)” is a cocktail of a careful, soft sound, and an edgier, darker outlier that seems to match the title of the song perfectly. Heavy instrumentals, boisterous, clashing cymbals, and a subtle aggression make up the backbone of the track, appealing to a wider audience, while also refreshing the idea of versatility. Summon The Octopi have figured out how to do something many modern artists would deem impossible: they have managed to speak to listeners without having the need of a voice on every song. There is a true originality to every track, speaking for Nonversations, marking it as more than a debut EP, but more as a launch station for a talented group of musicians. Nonversations is due out on the 17th of November. For more on Summon the Octopi, click HERE.